The Affordable Care Act (ACA) requires most individuals to have minimum essential coverage (MEC) or pay a penalty. The following questions and answers describe the individual mandate, the types of coverage that are considered MEC, and the penalty for not maintaining MEC. What are the ACA’s coverage requirements? The ACA requires most individuals in the U.S. to maintain minimum essential coverage or pay a penalty for each month they are uninsured. This requirement, known as the individual mandate, has been in effect since January 2014. Most insured people already have MEC, and they can continue the coverage that they have in order to comply with the individual mandate. Many people are eligible to receive financial assistance to help them obtain health coverage for themselves and their dependents, and some people are exempt from the mandate and won’t pay a penalty. What financial assistance is available to help uninsured people meet the requirement to have MEC? People with low and moderate incomes may qualify for Medicaid or a premium tax credit toward the cost of a plan in the marketplaces established by the ACA. Before 2014, Medicaid didn’t cover low-income adults without dependent children unless they were pregnant, age 65 or older, or had serious disabilities. Children were generally covered at higher income levels, but the income eligibility standards for parents in many states were very low. Under the ACA, states now have the option to expand Medicaid to cover low-income adults with incomes up to 138 percent of the federal poverty line. To date, 31 states and the District of Columbia have expanded Medicaid. 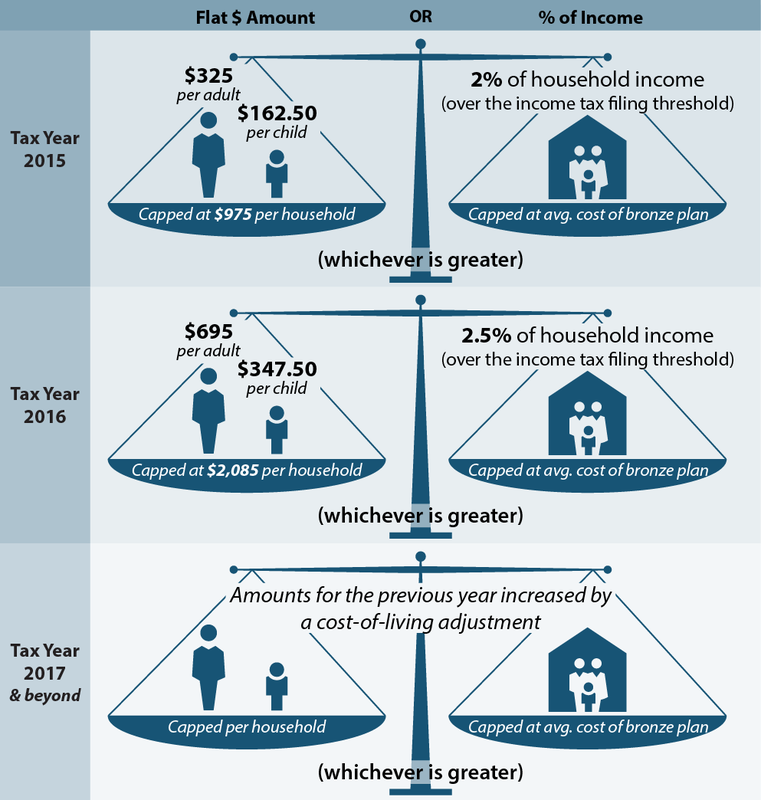 In addition, premium tax credits are available to people with incomes between 100 percent and 400 percent of the federal poverty line ($24,250 and $97,000 for a family of four in 2015) who purchase coverage in the marketplace. In general, to be eligible for premium tax credits, individuals must be U.S. citizens or lawfully present in the United States. They also cannot be eligible for other MEC, which includes most other types of government-funded health insurance such as Medicare or Medicaid, or employer-sponsored coverage that is considered adequate and affordable. Lawfully present immigrants who have income below the poverty line and are not eligible for Medicaid because of their immigration status can also qualify for premium tax credits. For more information on premium tax credits, see Key Facts You Need to Know About: Premium Tax Credits. What types of insurance are considered MEC? Most health insurance that people already have is considered MEC, including plans offered by employers, Medicare and Medicaid. All marketplace plans are also considered MEC. Table 1 lists the various types of coverage that qualify as MEC. Enrollment in any of these plans will satisfy the individual mandate requirements. On a case-by-case basis, the U.S. Department of Health and Human Services (HHS) may recognize other coverage that is not listed in Table 1 as MEC. The HHS website maintains a list of these plans. What types of insurance are not considered MEC? Medicaid coverage providing only limited benefits. For more detailed information on the types of coverage that are considered MEC for the purpose of satisfying the individual mandate, see the Minimum Essential Coverage Reference Chart. What types of Medicaid coverage are considered MEC and what types are not? Most Medicaid coverage provides full benefits and is considered MEC. People who are eligible for this coverage are ineligible for the premium tax credit. Enrollment in MEC Medicaid satisfies the coverage requirement. Some Medicaid programs do not offer comprehensive coverage and are considered non-MEC. HHS maintains a state-by-state list of the types of Medicaid programs available and whether each is MEC or non-MEC. People who enroll in non-MEC Medicaid coverage are eligible for a hardship exemption from the penalty for failing to maintain MEC. In addition, people who enroll in non-MEC Medicaid can also enroll in a qualified health plan and receive a premium tax credit, if otherwise eligible. Does eligibility for other MEC bar eligibility for premium tax credits? In general, yes. If a person is eligible for other coverage that is considered MEC, she is not eligible for a premium tax credit even if she does not enroll in it. However, there are exceptions to this, such as if someone is offered COBRA coverage or retiree coverage through an employer, or if the only MEC a person is eligible for is coverage in the individual market. For more detailed information on when eligibility for coverage bars eligibility for premium tax credits, see the Minimum Essential Coverage Reference Chart. Are U.S. citizens living abroad required to have MEC? All U.S. citizens are subject to the mandate. However, several exemptions are available for U.S. citizens who spend considerable time abroad. U.S. citizens who are not physically in the United States for a minimum of 330 full days within a one-year period are considered to have MEC for the year and do not have to pay the penalty for being uninsured. U.S. citizens who are bona fide residents of a foreign country for an entire tax year are considered to have MEC for that year. Individuals who qualify for this rule but are filing a federal tax return should file Form 8965 and indicate an exemption. Do non-U.S. citizens have to maintain MEC? All residents of the U.S., including non-citizens, are required to have health insurance coverage unless they qualify for an exemption to the coverage requirement. In general, anyone who is “lawfully present” in the U.S. must maintain MEC. This includes individuals who are Lawful Permanent Residents (LPR/green card holders), refugees, and persons granted asylum. Healthcare.gov maintains a list of immigration statuses that are eligible to purchase marketplace coverage. People with these immigration statuses are also required to maintain MEC during the year. A person who does not have an eligible immigration status will generally qualify for an exemption from the coverage requirement. For more information on coverage for immigrants, please see Key Facts You Need to Know About: Immigrant Eligibility for Health Insurance Affordability Programs. Do children have to pay a penalty for not having MEC? Individuals of all ages, including children, are subject to a penalty for not having MEC unless they qualify for an exemption. The taxpayer who claims a child as a dependent on his or her tax return is responsible for making the payment if the child does not have MEC and is not exempt from the coverage requirement. What happens if someone only has MEC for part of the month? People who have MEC for at least one day of the month are considered to have MEC for that entire month. For example, an uninsured person who starts a job and gets job-based coverage on June 20 is considered to have MEC for the entire month of June. Similarly, someone who loses Medicaid coverage on April 3 is considered to have MEC for the entire month of April. How do people report that they have MEC? People will report the months they did not have MEC on their tax return at the end of the year. If taxpayers claim any tax dependents, they will also need to report the months their tax dependents did not have MEC. If the tax household had coverage all year, they can check a single box. For months where taxpayers or their dependents do not have MEC, they can claim an exemption from the requirement to maintain coverage or calculate a shared responsibility payment. How will the IRS verify that a person has MEC? Entities that offer MEC – such as, health insurance plans, Medicaid, Medicare, and self-insured employers – will report to the IRS and to covered individuals who had coverage and for which months. Taxpayers will get this information on Form 1095-B. The IRS will also be informed of who had an offer of coverage from a large employer and whether that coverage met the affordability and minimum value standards. Form 1095-C will be issued to employees of large employers to report both their offer of and enrollment in coverage. Neither form needs to be attached to the tax return. The IRS will receive this information separately from the form filer. Taxpayers that disagree with the information on their Form 1095-B or –C should seek a correction from the entity that sent the form. How much is the penalty for not having MEC? As illustrated in Figure 1, the penalty is either a flat amount or a percentage of household income, whichever is greater. The amount of the penalty increases each year. The penalty amount can change depending on tax filing status and household income. Annie and Max are married with two young sons. They have household annual income of $39,500 and plan to file jointly. Figure 2 shows how to calculate the penalty if no one in the family had insurance in 2015. Now let’s assume that everyone in the family had insurance except for Max, who was uninsured all year. Figure 3 shows how the penalty calculation changes in that scenario. It is important to note that even though Max is the only household member who is uninsured, only the flat dollar amount calculation changes. The percentage of income calculation remains the same whether one member of the household is uninsured or if every member is uninsured. Is there a cap on the penalty amount? The penalty is capped in one of two ways, depending on which method is used. If using the flat dollar amount, the penalty is capped at three times the penalty amount for an adult. If using the percentage of income method, the penalty is capped at an amount equal to the national average premium for bronze level coverage in the Health Insurance Marketplace. For 2015, that cap is $2,484 a year ($207 per month) per individual, with a maximum of $12,420 a year ($1,035 per month) for a family with five or more members. Do people who have MEC for only part of the year have to pay the full-year penalty? People who don’t have MEC must pay a penalty for each full month that they or their dependents are without MEC, unless they qualify for an exemption from the individual mandate. Janet has an annual income of $22,000. She was uninsured with no exemption for 6 months during the year. Figure 4 walks through how to calculate her penalty for the six months she did not maintain MEC. How do people pay the mandate penalty? Individuals and households who don’t maintain MEC pay the penalty when they file their taxes each year. The imposition of the penalty may result in reducing the refund on the tax return or increasing the balance due. As with other tax debt, if there is a balance due and it isn’t paid, the IRS may offset that amount against any future refund due to the taxpayer. Any balance due on the penalty will accrue interest, but, unlike other tax debt, the IRS cannot impose liens or levies if it is not paid.